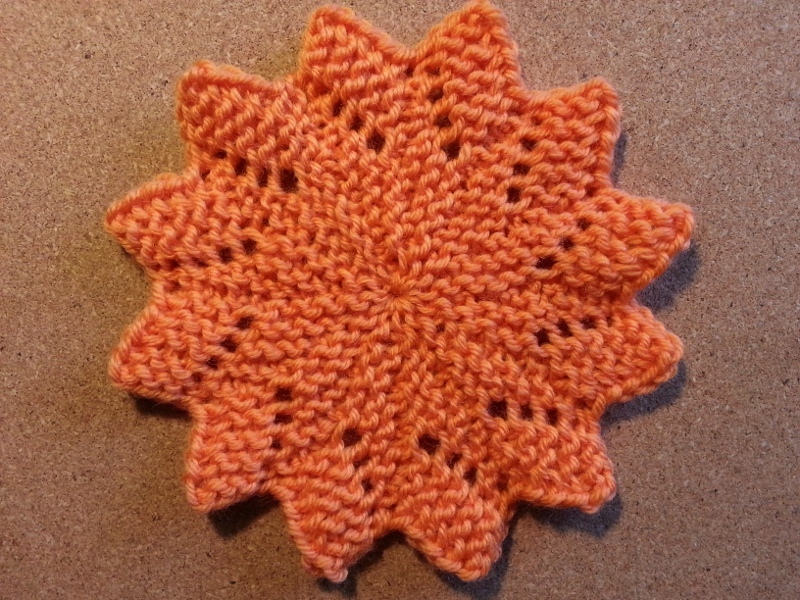 Do you teach people to knit and want something more interesting than a scarf or peggy square for their first project? 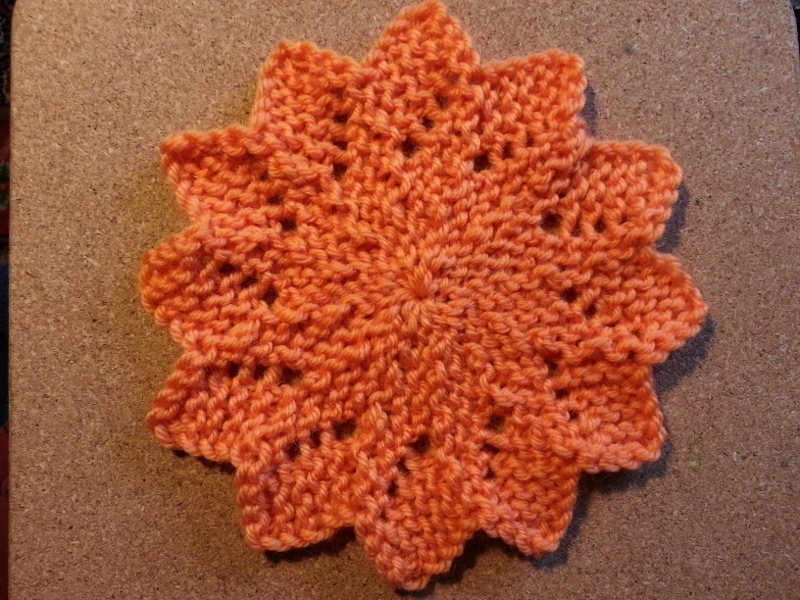 I wanted something that can be completed quickly and doesn't use much wool, is interesting, just a little bit magical and gives beginners a chance to practice something over and over so they get really good at it. There's nothing as encouraging for a beginner as seeing that they've really made progress and actually finished something. I found the “Almost lost wash-cloth” that appears to be a traditional pattern handed down from who-knows-when. You can read all about it and see the traditional pattern here. As the teacher you can substitute any other provisional cast-on you want and, as you get to cast off 12 times in one project, you can teach a variety of cast-offs so beginners can both practice and compare them. The 12 wedges let you teach a variety of short row techniques and you can also teach a variety of selvedges as each point has it's own selvedge. If you've ever wanted a good project for teaching “knitting back backwards” this is it. Do you want to teach purl? 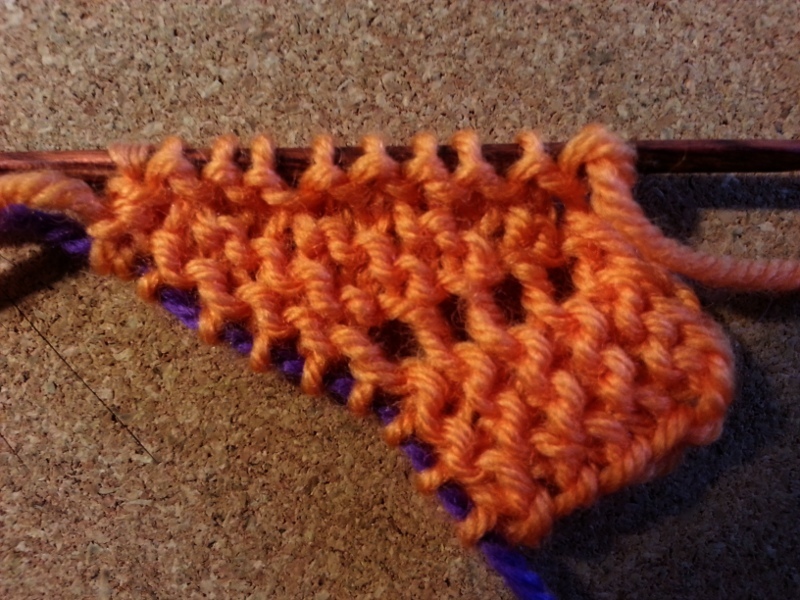 No problem – the pattern still works if you do the garter stitch in all purl. 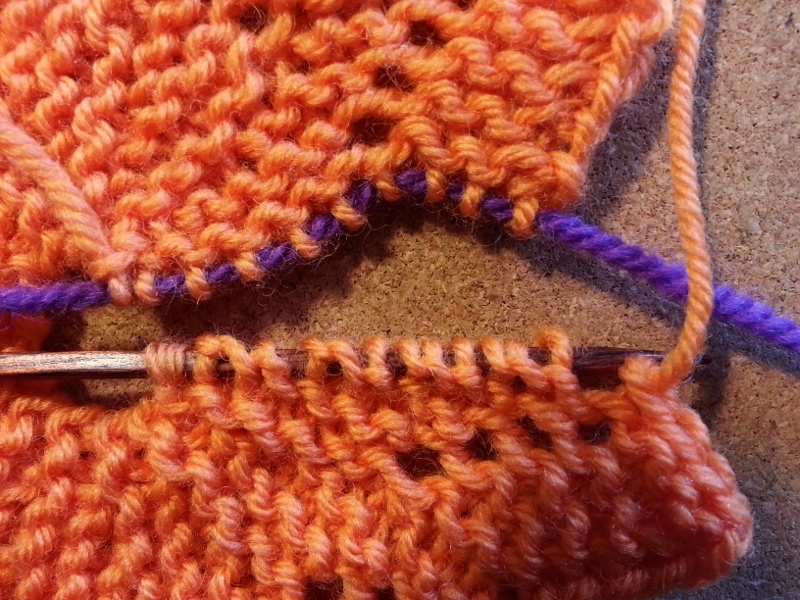 Why not teach one in all-knit and the other in all-purl? What can you use it for? Quite a lot! In knitting cotton it makes a fine wash cloth, in wool it makes a good coaster for a mug, or “hotpad” for a teapot (even better for that if you join two together). If you graft it together after 3, 4, 5 or 6 wedges you can make a variety of trumpets for knitted flowers (using finer yarns) and anything from there on up to all 12 wedges will make a skirt for a small doll. With a little adaptation the principles used here can be pressed into service making cuffs for gauntlet-style wrist-warmers and gloves - it will work very well with the patterns for sideways knitted garter stitch gloves. The techniques used here are also used for beautiful knitted lace doilies - I have some lovely examples in a book called (what else?) Knitted Lace Doilies by Tessa Lorant, which can in turn be easily adapted to make lace collars. Notes: When you count stitches after you have started doing GSR turns, count the double strands of the GSR as ONE stitch, not two. back needle up through the middle between both needles and down over the back of the back needle. I recommend starting off with size 4mm short needles (dpns if necessary) and 8-ply (double knitting) wool. 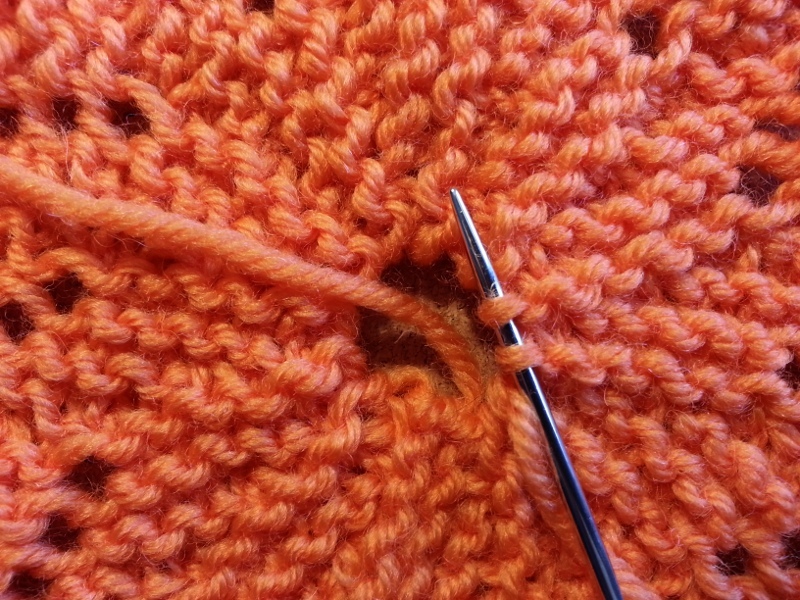 Using JMCO as a provisional cast on, cast 10 sts onto each needle. 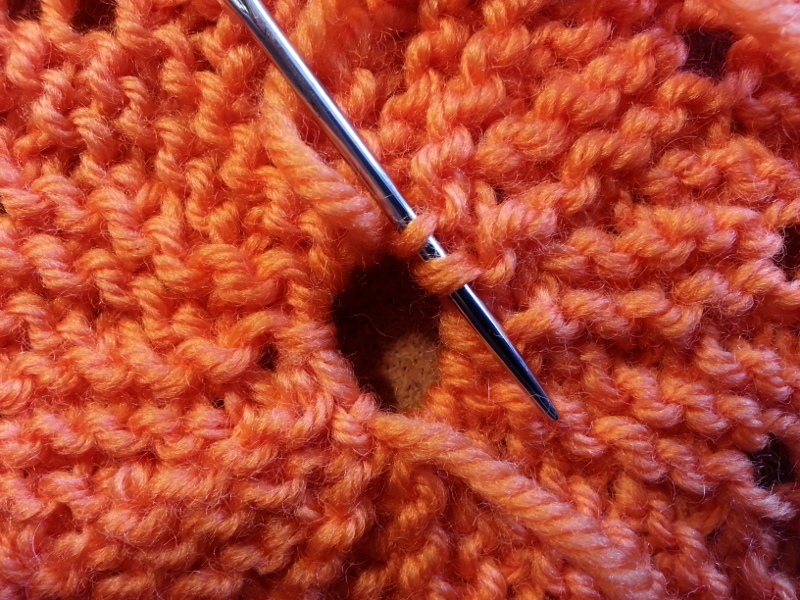 Put the sts on the needle that has the tail onto a spare piece of wool or small stitch holder. 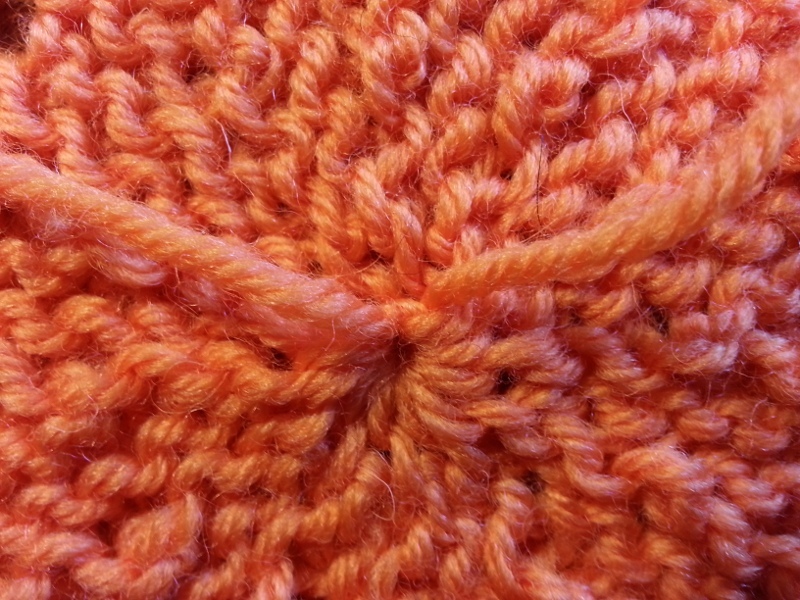 Completed JMCO with bumps facing up and stitches from second needle put on to a spare piece of wool. Make sure that the bumps from JMCO are facing towards you at the start of this row so that you will get continuous garter stitch. On the needle that has the ball yarn, S1 k-wise, K9, turn. The first point after 8 rows have been completed. Repeat rows 1 to 10 another 10 times (11 points made). Repeat rows 1 to 9 again. Row 10: Making sure that you slip the first st p-wise, cast off 4 using the suspended cast-off. Cut off a tail long enough to graft your last row (5 times the width of the 10 sts across your needle should be plenty) and pull the tail right through the last st you cast off. Thread it onto a wool needle. If you inadvertently tighten your last cast-off st then loosen it up again now so that it matches all the other cast-off sts. 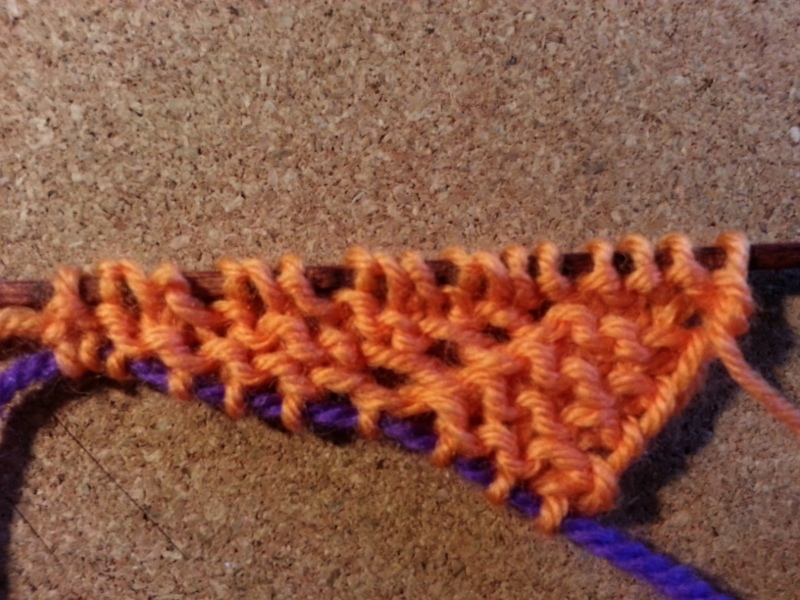 Four stitches have been cast-off on the last point and the tail pulled through. Place the 10 live sts from your thread or holder onto a knitting needle so that the needle point ends up at the outside edge of your medallion. Hold this needle behind the other. After stitches from the spare thread have been put back onto a needle. The second needle is being held behind the first and both needles show bumps directly under the needle when viewed from this angle. Using the tail you've just cut from the ball Garter St graft (Kitchener St) the remaining sts on your last row to the 10 sts from your provisional cast on on the back needle. You are working from the outside of the wash-cloth to the middle. Make sure as you do this that you pick up both strands of GSR slipped stitches from your previous row. Be careful to pick up both strands from the GSR stitch as you graft. Here I am “purling on” the GSR stitch. When I am ready to “knit it off” then the wool needle will lie behind the same two strands but it will point to the right. Pick up the selvedge “pips” from all around the inner selvedge in one direction with one tail and then repeat in the other direction with the other tail. Take both tails to the wrong side of the work and use them to draw the centre ring closed. Picking up the pips in one direction with the first tail. Picking up the same pips in the other direction with the other tail. 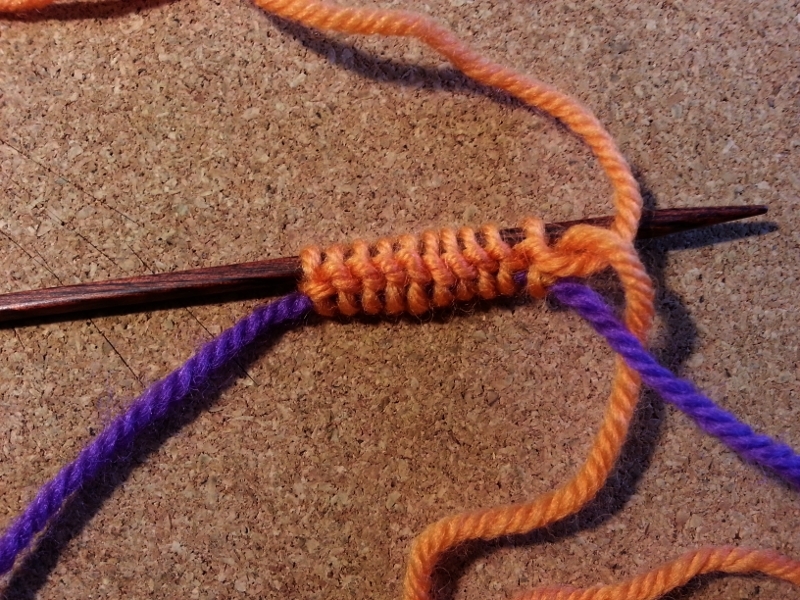 Tie the two tails together in a half knot (or square knot, if you prefer), weave the tails into the back of the work. Ends pulled tight and tied in a half-knot to close the centre. After the ends have been woven in on the back. 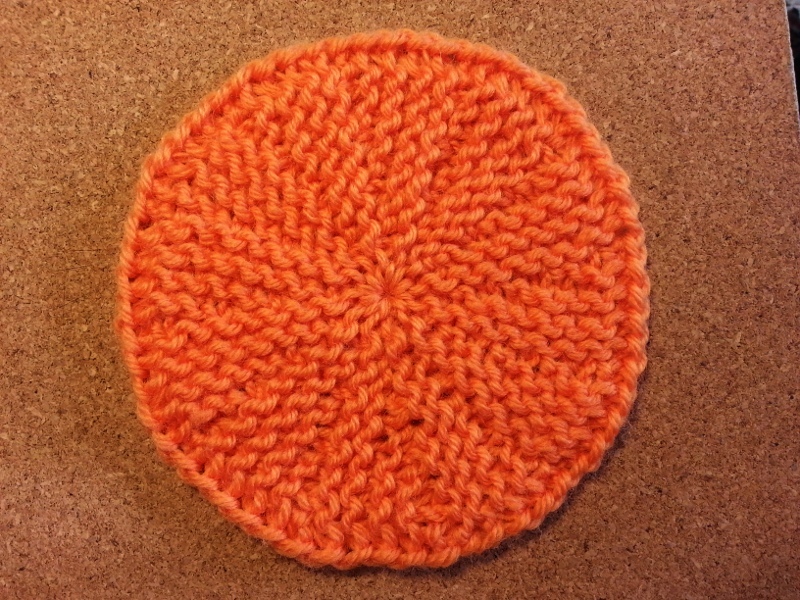 Do not fully trim the tails until after the first wash.
You can omit the points and produce a plain circle. In brief, this is the pattern. Row 1: S1 p-wise, K8, turn. Row 3: S1 p-wise, K6, turn. Row 5: S1 p-wise, K4, turn. Row 7: S1 p-wise, K2, turn. 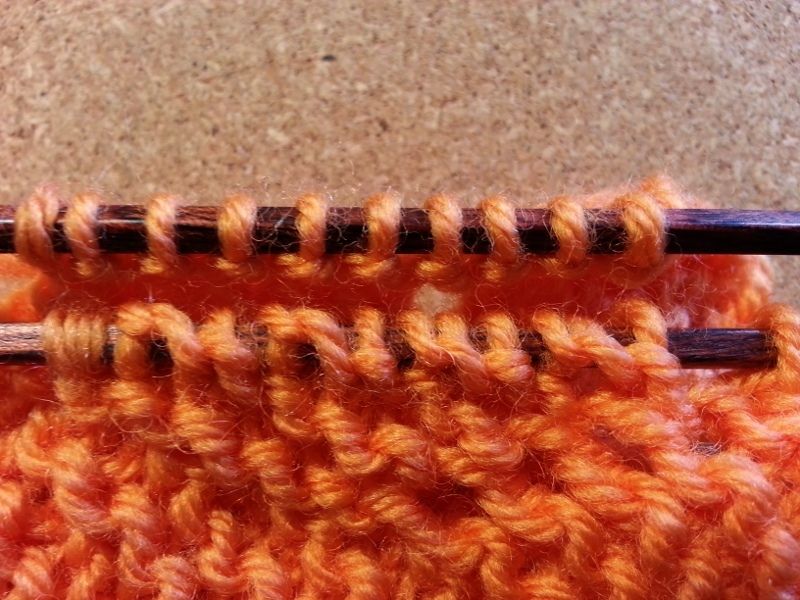 Row 9: S1 p-wise, K to end of row working both strands of the GSR slipped stitches together as you go, turn. Row 10: S1 k-wise, K to end, turn. 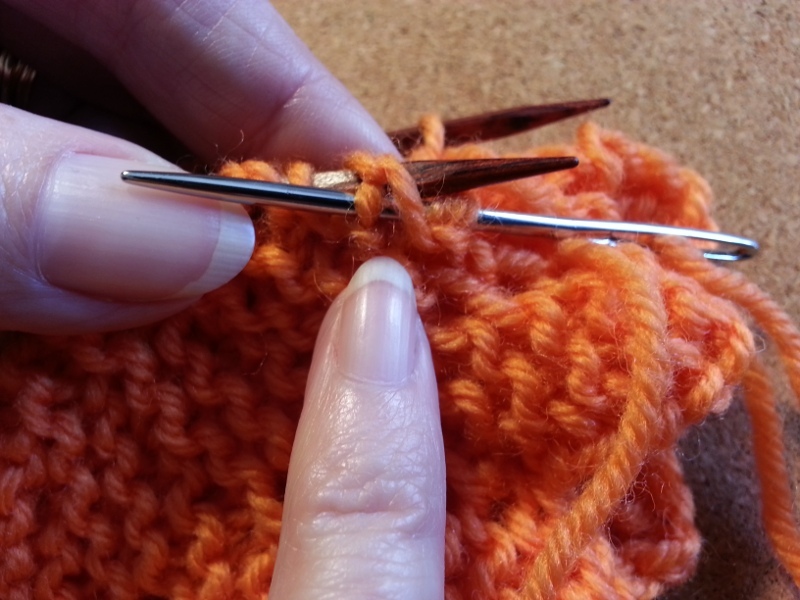 Row 10: Cut off a tail long enough to graft your last row (5 times the width of the 10 sts across your needle should be plenty) and pull the tail right through. Thread it onto a wool needle.